PRODUCT: Guardian #10715, 4' Temporary Poured Concrete Lifeline Anchor Strap with 5000 Lb. D-Ring. Temporary lifeline anchor for poured in place concrete. Price/Each. USE: To use, slip the looped end of the anchor strap over rebar, pour concrete over nylon sleeve to anchor strap securely and safely in place. When the concrete is set, attach a lanyard, self-retracting lifeline or other connecting device to the anchor strap. When your need for the anchorage is finished, simply cut and throw away the protruding strap. 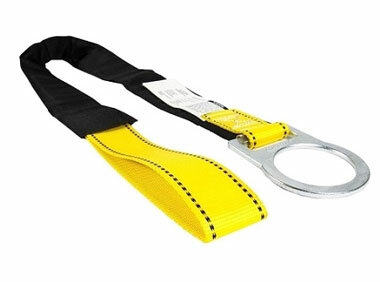 SPECIFICATIONS: 1¾"W abrasion-resistant nylon webbing with 6000-lb. tensile strength construction. Includes protective outer nylon sleeve. Forged steel D-ring withstands 5000 lbs. Compliance: Meets or exceeds all applicable ANSI and OSHA standards. This Concrete Anchor Strap is sheathed in heavy duty nylon webbing to protect the inner core webbing from abrasion and wear. The Concrete Anchor Strap is good for temporary use then can be cut off when the job is complete.